You hate boring meetings and want to get out early? Need to receive an SMS in order to have an excuse for leaving early? Do you simply want to remind yourself of something at a certain time? There are countless reasons to fake an SMS to yourself! 1) Simply type in the sender's name or phone number that you want to appear on your screen. In this version you can select a personalized screenshot (background). More info on the help screen in the programm. Press the start button and you are set. A fake home screen along with a faked date on the calendar icon will appear and the iPhone goes into a simulated sleep mode. At the preselected time an SMS message will appear on your iPhone.This will be the 'simulated' SMS that you have sent to yourself. Press either the 'Close' or 'Reply' button and return to your fake home screen. Of course, since the SMS is a fake you can’t answer it. At an opportune moment you should then terminate the application which is still running. In case there is a real phone call coming in after you have set the fake SMS this will interrupt AlibiSMS. 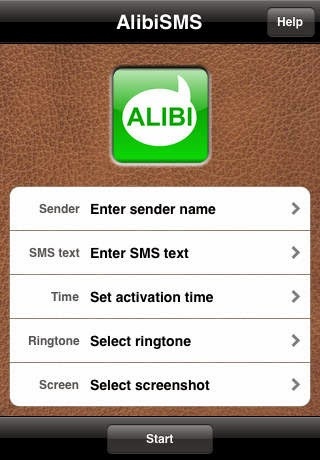 But after the phone call AlibiSMS will be active again and all data has been saved. You can even select a sender from your contacts by pressing '>' on the sender configuration screen. iPod touch users: This application will run on an iPod touch, too (audible alert only with built-in speaker; as there is no real SMS functionality you will have to create a screenshot of an iPhone home screen with an SMS icon yourself). 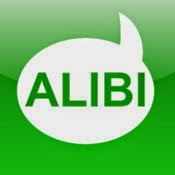 Define and save pre-configured alibi messages.